PHILADELPHIA -- A Southwest Airlines jet apparently blew an engine and got hit by shrapnel that smashed a window and damaged the fuselage Tuesday. Southwest Flight 1380 was flying at about 30,000 feet when the explosion took place. The incident killed one passenger and injured seven others, authorities said. The plane, a Boeing 737 bound from New York to Dallas with 149 people aboard, made an emergency landing in Philadelphia just before noon as passengers breathing through oxygen masks that dropped from the ceiling prayed and braced for impact. National Transportation Safety Board (NTSB) chairman Robert Sumwalt said one person was killed. It was the first passenger fatality in a U.S. airline accident since 2009, Sumwalt said. CBS News has learned that the deceased has been identified as Jennifer Riordan, a married mother of two. She worked as a Wells Fargo employee from New Mexico. Passenger Marty Martinez joined CBSN on the phone from the plane that a woman was injured and was taken off the plane. "There was blood everywhere," Martinez told CBSN's Anne-Marie Green, adding that people on the plane rushed to help the injured woman while a passenger was trying to plug the hole in the window with no success. At a Tuesday night press conference, NTSB's Sumwalt said he's "very concerned" about metal fatigue in the jet engines of the flight in question and that NTSB will focus on a missing engine fan blade. He also mentioned that somebody had found a part from the jet 70 miles north of the Philadelphia International Airport. Southwest CEO Cary C. Kelly told Sumwalt late Tuesday that the airline will begin enhanced inspection procedures of its fleet very soon. The flight was powered by CFM engines. An official told CBS News that CFM has sent representatives to the scene to support the investigation. "Everybody was crying and upset," she said. "You had a few passengers that were very strong and they kept yelling to people, you know, 'It's OK, we're going to do this.'" Martinez did a brief Facebook Live posting while wearing an oxygen mask. He posted, "Something is wrong with our plane! It appears we are going down! Emergency landing!! Southwest flight from NYC to Dallas!!" "I had WiFi, and I knew I couldn't get any sort of text messages through, so I jumped on Facebook Live," Martinez told CBSN. "I thought I was cataloging the last moments of my existence the whole way ... It was absolutely terrifying." He said smoke came into the plane through the window and it was difficult to breathe through the oxygen mask. "It was the most terrifying experience," Martinez told CBSN. "I mean, to think that as I'm going down and people are jumping in my live feed and I'm like 'the plane's going down' and I'm just thinking that at any moment now my internet could cut out and that would be that's it." Tracking data from FlightAware.com shows Flight 1380 was heading west over New York's southern tier at about 32,200 feet traveling 500 mph when it abruptly turned toward Philadelphia. It was the first death stemming from an in-flight accident on a U.S. airliner since 2009, when 49 people on board and one of the ground were killed in the crash of a Continental Express plane near Buffalo, New York. Southwest has about 700 planes, all of them 737s, including more than 500 737-700s like the one involved in Tuesday's emergency landing. It is the world's largest operator of the 737. The Boeing 737 is the best-selling jetliner in the world and has a good safety record. NTSB investigators said one of the engine's fan blades broke off from the hub during the flight. The broken edge of the blade showed crack lines consistent with metal fatigue. 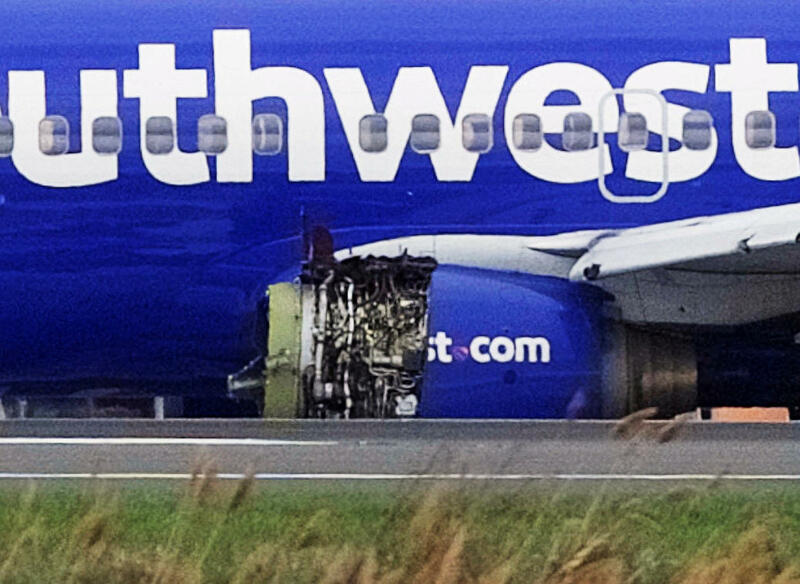 Before Tuesday, Southwest had never had an accident-related fatality of a passenger, although a young boy died in 2006 when a Southwest jet skidded off a runway at Chicago's Midway Airport, crashed through a fence and collided with the boy's family's car.